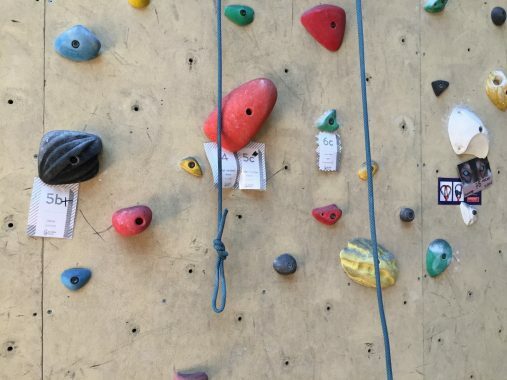 A very cold or rainy day is a perfect excuse to go to a climbing center! Everyone can do it! Children and adults! Like any sport you only need minimal physical qualities to practice and feeling good doing it. The most important factors are enthusiasm and desire for self-improvement. It’s an interesting activity, can be even a challenge because climbing a wall isn’t something normal that you do every day. You’ll feel adrenaline while going up, will be afraid of taking a false step and will feel satisfaction when you reach the top 😎. Obviously, don’t worry about the security because they’ll explain you all you need to know. The only requirement is that you go with a partner, someone who hold the rope 😉. But if you want to go alone there are centers called ‘bouldergyms’ which are prepared to climb by yourself without ropes, on Wikipedia – Bouldering you can read more about that. 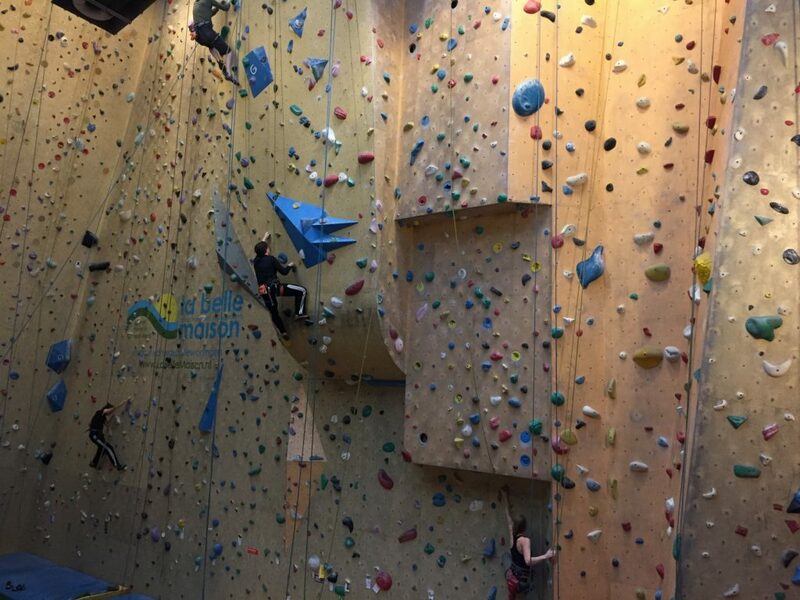 There are several climbing centers in the Netherlands, I went to Klimmuur Centraal in Amsterdam, so the photos and explanations are about this place. Anyway, I’ll list several climbing and bouldering places although I haven’t gone. The most of the climbing centers have an area to practice bouldering as well but it is normally small. 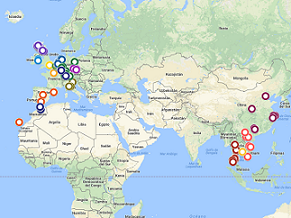 As you can see in the website there are four Klimmuur centers: Amsterdam, Haarlem, Rotterdam and Den Haag. Others centers in the Netherlands. You can check the website to know exactly where it is or check the layer named ‘Climbing’ on my map to search a place near you. Mountain Network – in Amsterdam, Heerenveen, Arnhem, Nieuwegein and Dordrecht. 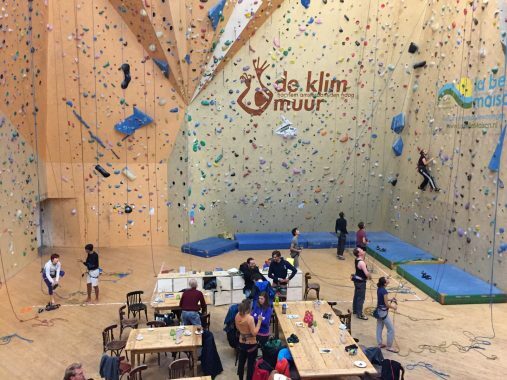 Klimcentrum Neoliet – in Tilburg, Rotterdam, Eindhoven and Heerlen (the center in Rotterdam is a bouldergym). I’m sure that in this list there is one center close to you 😉, some places look like more professional than others. If the website is only in Dutch you can try facebook website or translate it with your web browser or Google Translate. Also, I suggest you to search the centers on Google Maps to see the photos, some centers are amazing like the last one in Groningen! 🚍 To know how to get there you can use Google Maps which provide you with timetables or you can check the local public transport site (but by bike should be your choice 😜). In particular the Klimmuur Centraal Amsterdam is 1.2 km from Amsterdam Central Station, very close to NEMO. You can go by bike or walking from the station. ➤ How can I climb? If you have never climbed you should have an introductory lesson to learn how to climb safely. It’s easy so you don’t worry, besides the instructor will stay with you until you can climb by yourself. All centers have an introductory lesson to learn. 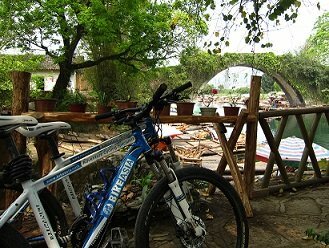 Generally, in the price is included the entrance fee, the instruction and equipment (shoes, ropes, harness). 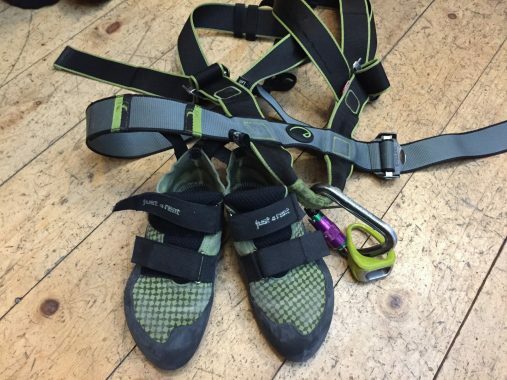 But as I said before, you can climb without ropes in a bouldering area, you have a look to my centers’ list and in this case you’ll only need climbing shoes, you can rent them there. To give you an idea, we paid €21,50 pp in Klimmuur Centraal for a day including an introductory lesson. Also, there are more courses and training if you like this sport and you want to improve. Maybe you bear a great climber inside! But, if you only want to have a good time with friends it is a fantastic option as well 😉. Now, maybe you’re thinking: ‘How can I climb like the people on those photos? It doesn’t look easy’. Well, there are several routes with different difficulty which depends on the rocks’ colors. You should start with an easy route. Every route is formed by one color, and the first rock has a note with the difficulty code: 3, 4, 5, 5c, 5b, 6a, 6b+, etc the low numbers are the easiest. This will be explained with more details by the instructor. Last thing, you should wear comfortable sport clothing and the climbing shoes should be tight-fitting. I had climbed before in Spain. 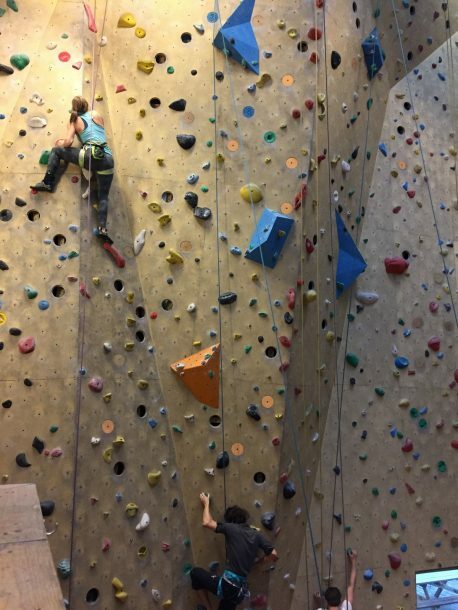 I went to a climbing center which had a special system of ropes, I didn’t need a partner to hold the rope. There was an automatic pulley so I didn’t really learn to climb. The feeling is different because you ignore the rope whereas with a partner you should pay attention to not climbing fast because he must collect the rope bit by bit. Now, I can say: ‘I know how to climb 🙂’ (or at least I’ve the knowledge to climb safely). An advice: do several times the easy routes to train your muscles (especially the forearms). When you try a complicated route your forearm gets tired and the next time that you try to climb you won’t have strength and you can suffer cramps on your forearm. That happens to me always because I like the challenges, the easy routes aren’t for me 😄. The introductory lesson and the rented equipment were good. There were many routes, complicated and easy. Also, you can take a break to drink or eat something in the bar. I learned and enjoyed a lot so the experience is totally recommendable 😊. 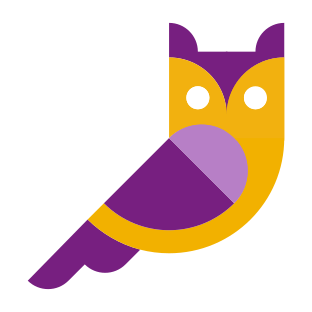 ➽ More activities in the Netherlands on Extra Netherlands. Any contribution or question is welcome, please write a comment!